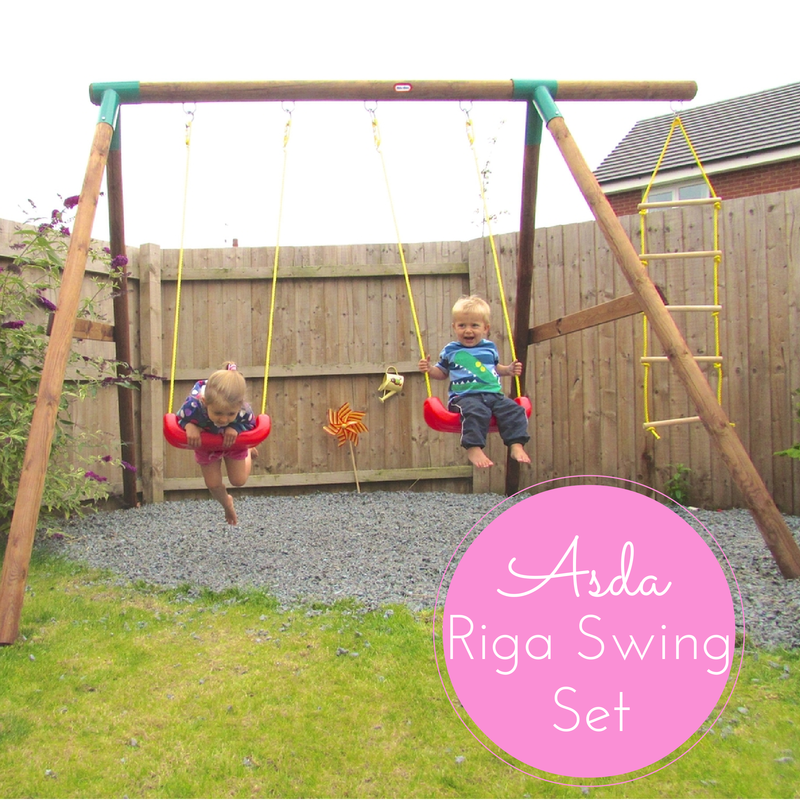 Last month we were so lucky to be sent the Little Tikes Riga Swing Set from Asda to complete our garden. Since then the children have been putting it through its paces so here's what we thought. It took Mr H about an hour to put the swing together. It came in five pieces with metal brackets to hold the frame together. It was fairly straight forward, but would have been easier with two people. Once it is completed it comes with metal rods to fix it into the ground, so this takes a bit more work to do but ensures the swing is going nowhere when those children are swinging to the sky. I love this swing as it has a wooden frame and so blends in really well with our garden. We have a wooden playhouse from Big Game Hunters and a wooden deck, so this frame was perfect. It is on the large side so doesn't quite fit our play area, but we are going to extend it so the children have plenty of soft surface to land onto. The rope of the swings is really thick and looks like it would hold anything. It also has steel hooks at the top holding the seats and ladder up as well as a pulley system to adjust the height of the swings as the children grow. This immediately became the most popular piece in the garden. Straight away the children ran to the swing and asked to be pushed. Both are a little small to get on themselves, although they are slowly mastering it, but they will quite happily lean over the seat when mummy and daddy get fed up of pushing so they can pay themselves. They also like hanging off the bars at the side and I caught Little J the other day attempting to climb the rope ladder - of course! They also like to hang off the bottom of the frame and slide down it, they really will find any way to climb! We have had some friends over a few times, and even with them it is their preferred item to play on. There's been a fair few fallings out over who gets a turn, but in the end they all push each other so it works out. This swing retails at £100. I think this is a pretty good price for such a sturdy set with multiple items. It is missing a slide, but I don't think the price would be so low if it had one. I would compare it to Plum products, which retails for a lot more than this, so I feel it has fantastic value for money. 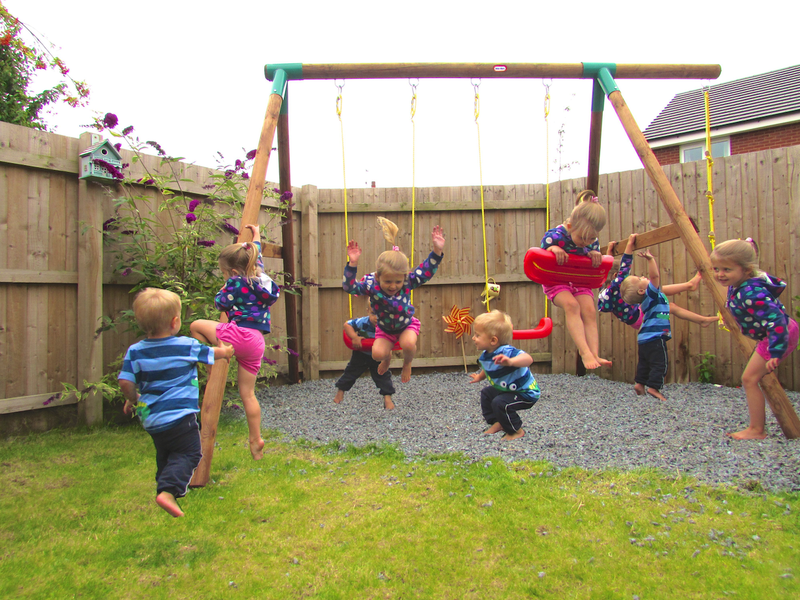 My children adore the new swing set and it above and beyond the most popular item in our garden. It is the final piece of the play area and has finished it off beautifully. I can definitely recommend it to anyone.